Subrahmanyan Chandrasekhar, better known as Chandra, was born on October 19, 1910, in Lahore, India (now part of Pakistan), the first son of C. Subrahmanyan Ayyar and Sitalakshmi (Divan Bahadur) Balakrishnan. Chandra came from a large family—he had six brothers and three sisters. As the firstborn son, Chandra inherited his paternal grandfather's name, Chandrasekhar. His uncle was the Nobel Prize-winning Indian physicist, Sir C. V. Raman (1888–1970). and motivation, he studied on his own and rose to the head of the class, completing school by the age of fifteen. After high school Chandra attended Presidency College in Madras, India. For the first two years he studied physics, chemistry, English, and Sanskrit. For his bachelor's honors degree he wished to take pure mathematics but his father insisted that he take physics. Chandra registered as an honors physics student but attended mathematics lectures, where his teachers quickly realized his brilliance. Chandra also took part in sporting activities and joined the debating team. A highlight of his college years was the publication of his paper, "The Compton Scattering and the New Statistics." These and other early successes while still an eighteen-year-old undergraduate only strengthened Chandra's determination to pursue a career in scientific research, despite his father's wish that he join the Indian civil service. Upon graduating with a master's degree in 1930, Chandra set off for Trinity College in Cambridge, England. As a research student at Cambridge he turned to astrophysics, inspired by a theory of stellar (stars) evolution that had occurred to him as he made the long boat journey from India to Cambridge. In the summer of 1931 he worked with physicist Max Born (1882–1970) at the Institut für Theoretische Physik at Göttingen in Germany. In 1932 he left for Copenhagen, Denmark, where he was able to devote more of his energies to pure physics. A series of Chandra's lectures on astrophysics given at the University of Liège, in Belgium in February 1933 received a warm reception. During a four-week trip to Russia in 1934—where he met physicists Lev Davidovich Landau (1908–1968), B. P. Geraismovic, and Viktor Ambartsumian—he returned to the work that had led him into astrophysics to begin with: white dwarfs. Upon returning to Cambridge, he took up researching white dwarfs again. 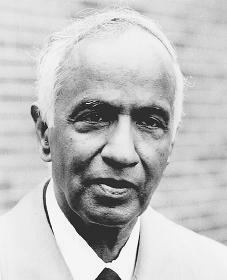 As a member of the Royal Astronomical Society since 1932, Chandra was entitled to present papers at its twice monthly meetings. It was at one of these that Chandra, in 1935, announced the results of the work that would later make his name. As stars evolve, he told the assembled audience, they release energy generated by their conversion of hydrogen into helium and even heavier elements. As they reach the end of their life, stars have less hydrogen left to convert so they release less energy in the form of radiation. They eventually reach a stage when they are no longer able to generate the pressure needed to maintain their size against their own gravitational pull, and they begin to shrink, eventually collapsing into themselves. Their electrons (particle with a negative charge) become so tightly packed that their normal activity is shut down and they become white dwarfs, or tiny objects of enormous density. In 1937 Chandra returned home to India to marry Lalitha Doraiswamy. The couple settled in the United States. A year later Chandra was charged with developing a graduate program in astronomy and astrophysics and with teaching some of the courses at the University of Chicago's Yerkes Observatory. His reputation as a teacher soon attracted top students to the observatory's graduate school. He also continued researching stellar evolution, stellar structure, and the transfer of energy within stars. In 1944 Chandra achieved a lifelong goal when he was elected to the Royal Society of London, the world's oldest scientific organization. In 1952 he became the Morton D. Hull Distinguished Service Professor of Astrophysics in the departments of astronomy and physics, as well as at the Institute for Nuclear Physics, at the University of Chicago's Yerkes Observatory. Later the same year he was appointed managing editor of the Astrophysical Journal, a position he held until 1971. Chandra became a United States citizen in 1953. He retired from the University of Chicago in 1980, although he remained on as a post-retirement researcher. In 1983 he published a classic work on the mathematical theory of black holes. His semi-retirement also left him with more time to pursue his hobbies and interests: literature and music, particularly orchestral, chamber, and South Indian. Chandra died in Chicago on August 21, 1995, at the age of eighty-two. Throughout his life Chandra strove to acquire knowledge and understanding. According to an autobiographical essay published with his Nobel lecture, he was motivated "principally by a quest after perspectives." The Biographical Dictionary of Scientists, Astronomers. London: Blond Educations Company, 1984, p. 36. Goldsmith, Donald. The Astronomers. New York: St. Martin's Press, 1991. Land, Kenneth R., and Owen Gingerich, eds. A Sourcebook in Astronomy and Astrophysics. Cambridge, MA. : Harvard University Press, 1979. Wali, K. C. Chandra: a Biography of S. Chandrasekhar. Chicago: University of Chicago Press, 1991.